This photo is of the Linden Bakery Scottish Fruit Slice Line taken in 1974. It shows Hugh Forest (left) and John Davey unrolling yards of pastry for this product. The man in the cap is # Ure Department Manager. Taken in 1979 this shows the finishing touch to the manufacture of Sponge Oysters. They were introduced in March 1979 to a number of freezer centres as a new addition to Lyons frozen cake range. They were a finger-shaped cake sliced down the middle with a layer of mixed fruit and jam and a light whipped filling topped with a glace cherry and packed 5 to a box. These were only made at Linden Bakery, Glasgow.The girls are Pat McLaughlin (left), Rose Livingston (centre) and Jackie Douglas. Linden Bakery. Making Treacle Scones in 1976. On the right is Foreman Pat Hughes and Alastair Harper making Treacle Scones. Wakefield Bakery - Engineer's workshop. Eastleigh Bakery - 'Ovenman P. Gordon puts trays of baked finger rolls to cool after they've left the oven'. The history of the Provincial Bakeries, or satellite bakeries as they were sometimes known, has not been widely recorded and there is a paucity of information in the imperfect records which do exist. The emergence of these small bakeries came about initially to satisfy the growing number of teashops which were opening around the country in the first part of the twentieth century. Supplying these with food products from Cadby Hall was becoming troublesome and so management decided to open smaller satellite bakeries, often in the larger teashops themselves, to supply them with some of their requirements. This ensured freshness of product and had the added benefit of reducing transportation costs from London and other large centres. Fundamentally there were three distinct groups of provincial bakeries: 1) Those pre-war provincial bakeries supplying teashops; 2) Cake production bakeries supplying the Lyons cake sales nationally located at Bristol, Oxford, Smethwick, Wakefield, Hove, Birmingham, Glasgow and Cadby Hall; 3). Bread production bakeries which were originally part of Lyons Bakery but which, in 1963, were formed into a separate trading entity known as Lyons Bread Division.Each provincial bakery had a similar organisation; a General Manager with sales, Production and Engineering departments plus a local accountant and administration office. Marketing, National Accounts, Technical and Central Accounts were provided by a small head office based at Cadby Hall. Decentralisation of control was needed because bread production and sales/deliveries were needed on a daily basis and this could only be achieved from local centres. The first provincial bakery opened at 45 High Street, Sheffield, in the teashop known as PA (Provincial 'A') in about 1905. This was the first provincial teashop (teashops outside London) to have opened and the bakery there serviced the two teashops in Sheffield namely, 45 High Street (opened in 1900) and 2 Pinstone Street (opened in 1907). Shortly afterwards provincial bakeries opened at Liverpool, Bristol, Leeds, Birmingham, Manchester, Bradford and Nottingham and so the Provincial Bakeries Department was born. Apart from Sheffield the opening times of most of the provincial bakeries are not known. It is known, however, that the Liverpool Bakery came into the Group when Lyons acquired the Ceylon Café Company in 1909. This was situated in Lime Street, Liverpool, and the cakes and produce made there used Irish eggs and butter. The Ceylon Café Company also had a number of teashops in the Leeds and Liverpool areas, which were converted to Lyons teashops and it is possible one or more of these may have had a bakery associated with it. There was little in the way of automation in those days and batters and mixtures were made by hand. One of the first baking managers at Liverpool was Jack Stall; his family would clock up collectively nearly 400 years of service with the company with at least three of them serving long periods with the Provincial Bakery Department (Jack, Frank and Henry). The original Frank Stall, from whom the all the Stall's and Bents originated, was foreman of the Vienna Bakery at Cadby Hall in 1895. During the Second World War most of the provincial bakeries, then in being, participated in the government's Rural Pie Scheme. The government originally intended to allocate rationed raw materials such as fat, sugar and flour to the Women's Voluntary Service (WVS) so that their organisation would be responsible for the pie making. It soon became apparent that their organisation, proficient as it was, was woefully ill-equipped to handle such an undertaking. Their allocations of food was subsequently allocated to the large baking companies and, in the case of Lyons, the business of baking pies was distributed between the Cadby Hall (Henry Telfer, Fulham) and the provincial bakeries thus making their availability more geographically organised. This saved on transportation which during the war years became progressively severe. The following is a list of all known provincial bakeries, in alphabetical order, and brief features of known information. This was just a distribution centre with supplies delivered from Cadby Hall every day including weekends. No production was carried out. The depot served the areas of Evesham, Stratford-on-Avon, Leamington Spa, Aylesbury and Henley-on-Thames. The depot was established in 1966 and in 1970 had a staff of 37. It is thought that the Bradford Bakery was situated in the teashop at 57 Market Street which opened in 1907. It probably provided bakery goods for the teashop which closed in 1928. See also entry for Manchester. The Bristol Bakery despatch, as it was originally known, became a Bread Bakery when production at Felix Road commenced on 22 May 1950 and it was here where Lyons' Superbread was made. It was equipped with the most up-to-date plant, including a slicing and wrapping machine capable of handling 2,000 loaves per hour. A feature of the new plant was that it enabled the company to supply Superbread outside the London area for the first time and it was expected that a production of 25,000 quarterns per week would be achieved. The bread was distributed by a fleet of roundsmen's vans operating from a depot attached to the bakery. Superbread became the dominant bread in the Bristol area and the bakery became a very profitable unit. A cake bakery followed and was situated at Redcross Street where Swiss rolls, Baby Rolls, Trifle Sponges and Jam Sandwiches (cakes) were made. In 1957 the bakeries moved to new premises on the Brislington Trading Estate (to the south-east of Bristol centre) and became known as Brislington Bakery. This was mainly a bread bakery plant but cake products included Frostie Cakes. In 1968 their English/Vienna bakery was re-equipped with new baking machinery at a cost of £60,000. Added to this was a sum of £30,000 for extensions to the administrative block which were completed in August 1968. The investment became necessary to meet the increased demand for buns, rolls and other goods in the West Country and Birmingham areas. Work on the project started in October 1967 and not only involved the introduction of an automatic roll plant and a new double-deck oven, but the re-designing of the whole bakery layout. Henry Stall was the Unit's Production Manager at this time and his equipment produced 8,000 items per hour. The new double-deck tunnel, which replaced an earlier reel oven, was new to the Bread Division and Bristol were the first in Lyons to use it. One of the double-deck oven's features was the ability to handle different products simultaneously. Its capacity was 42 trays per deck with each tray holding between 35 and 40 pieces, and it took approximately 6.5 minutes to bake. To produce its weekly total of nearly half a million fruit & currant buns, country baps, super rolls, finger rolls and crusty rolls the bakery consumed 22 tons of flour and 30 cwt of sugar a week. The extension to the factory enabled the management to restart factory tours which had been curtailed because of the lack of facilities and space. Bristol was the sole manufacturing site of hand-applied Frosties. In 1950 Bristol Bakery won the Provincial Bakeries Shield for the first time. There was also a Provincial Tea Depot at Bristol which was opened by George Pollard in 1905 (still active in 1947) but it is unclear as to whether this was located in the same building as the bakery. Pollard's son was employed in the office. The Chessington bread unit was established at Chessington in the 1954. In 1970/71 when the Cadby Hall bread production unit closed Chessington was enlarged with a new 15-sack plant. The despatch was reorganised and a modern dock built for the easier loading of vans. A large DCA doughnut plant was installed and this supplied the total doughnuts needs for J. Lyons. A small Swiss roll plant supplied some Lyons cakes products. Crawley opened as a Bread Bakery in 1957. It was one of the larger provincial bakeries selected for enlargement when the Cadby Hall bread production unit closed in 1970/71. In the 1960s an American type roll plant to produce Wimpy buns for all the Wimpy bars in the country was set up with a national distribution fleet, and with freezer/defrost facilities. 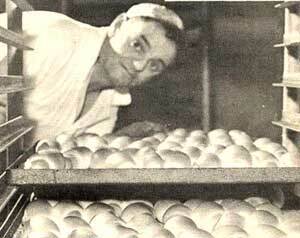 It was also developed as a specialist morning goods bakery (soft rolls, buns, crumpets etc.) and had the latest equipment installed from manufacturers in Britain, the continent and the US. It produced crumpets during the winter period for all the Bread Sales operations. No details are known of this operation. 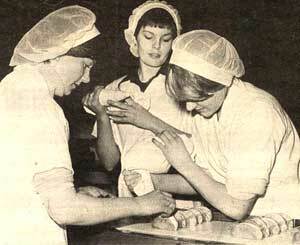 The Southampton Bakery started in 1965 operating for one year as a Lyons Bakery Cake Depot. Then there was a move to Eastleigh in 1966 to what was described as a 'wooden hut and four acres of land'. In its first year, supplied with goods from the Bristol Bread Unit, the depot had just 12 journeys. A year later there were 21 and the depot began to get its product from the Crawley Bread Unit. In December 1966, a new despatch building was added. The most up to date in the Bread Division, it eliminated the use of fork lift trucks. Pallet loads of good were wheeled off the Beavers (Lyons' long distant transport trucks) onto the delivery vans thus speeding the distribution process. This Unit was the general responsibility of # Stringer, Regional General Manager (South). In 1968 new baking plant was installed at the Eastleigh Bread Depot to meet the increasing demand in southern England for Vienna and morning goods products. The work took 5 months to complete which started in January 1968. Chris Long was the Production Manager at that time. When complete the unit made finger, super, mini-super and large crusty rolls, country baps, and fruit & currant buns. It was planned to increase the number of items to over 20 which included crusty bread lines and new products like scones and small country loaves which were popular in the area. The new bakery had the latest type of roll plant which automatically divided, moulded and panned the dough. There was also a small crusty bread plant with a divider and cone moulder. From the two plants the dough passed to the static prover. This device had temperature and humidity controls making the proving process about 20 minutes; much faster than the previous method when the dough was left to prove at room temperature. About 30 staff worked the bakery when it was at full output. This provincial unit served an area within a 30-40 mile radius of Southampton extending to the isle of Wight, Bognor Regis, Poole and Newbury in Berkshire. This area was covered by 29 Salesmen who were managed by Jack Jenkins. In October 1970 it was announced that the Eastleigh Bakery would become a full bread unit, with Chessington and Crawley, and that most of the Cadby Hall bread production would be transferred. Building work at Eastleigh had been started several weeks previously and trials of the 15-sack bread plant would start in 1971. This plant incorporated features such as automatic oven-feed and suction de-panning designed to eliminate the more arduous aspects of bread baking. 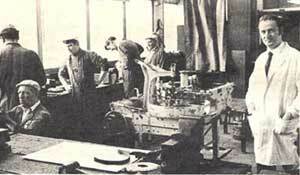 Because of the large amount of space at Eastleigh working conditions were generally of a high standard. The Eastleigh Bakery continued in production after Lyons Bakery Ltd were sold to Manor Bakeries but the plant is due to close at the end of 2005 with production moving to Carlton, Yorkshire. The Garret's Green factory was part of the Scribbans-Kemp Fuller, Kunzle Group. It majored in small cake manufacture and most of its specialised equipment was designed and made on the premises in the factory's 22-man machine shop. Mint Meringues, Fondant Fancies, Macaroons, Cakelets (a chocolate enrobed cake) and home made Crackle Cakes were just a few of the special items made. Own label cakes were made also for Marks & Spencer, British Homes Stores and Tesco. One of its more famous lines was the production of Showboats, a chocolate case shell, filled with sponge and butter filling and topped with a piped decoration. These cakes were individually wrapped and packed into boxes of six or twenty-four. Nearly a half million were produced every week at the Garret's Green factory and it was the only chocolate-shelled cake of its kind made in Britain. Linden Bakery at Govan, Glasgow, was built in 1927 as a biscuit factory and was taken over by Lyons Bakery in 1962 from the Gailbraith retail grocery chain. At this time the product range was more broadly based with morning goods the speciality. Gailbraith remained one of Linden Bakery's biggest customers right up to the mid 1970s. In September 1971 Linden Bakery Ltd was formed to expand the Lyons share of the £20 million cake market and operated as a self contained unit. Research indicated that the Scottish market was basically different in structure from the national pattern in that people in Scotland spent more per capita on cake than people in other parts of the British Isles. Demand in Scotland was also greater for morning goods (rolls, crumpets and buns). The Scottish bakery therefore concentrated on developing short-life products designed to be eaten within hours of being baked. As a result every customer was called on every day, excluding Sunday, by the 50 strong Linden Bakery fleet supported by a number of vans operated on a franchise basis. The bakery also produced own-label goods for the catering trade. By 1974 they were producing Scotch Pies and Bridies, Hot Plate (potato) Scones and Scotch pancakes in addition to their cake lines. Seasonal cakes for Easter and Halloween were also made. Linden Bakery also had an Edinburgh depot at Broxburn. Until 1976 Lyons Bakery were also operating from the same site and at one time were making Harvest Pies there. When the bakery production was transferred to Carlton, Linden Bakery Ltd continued to operate. In March 1979 it started producing Sponge Oysters, part of the new frozen cake range Lyons Bakery had introduced. Sponge Oysters were an entirely new small cake, produced exclusively at Glasgow, and consisted of a curl of sponge cake, a layer of mixed fruit and jam and a light whipped filling topped with a glace cherry and packed 5 to a box. The fresh frozen cake range had been introduced into Bejam in 1977. Despite the new lines, Linden Bakery had been trading for several years at a loss and was closed in February 1981 with the loss of 290 permanent staff. The Managing Director of Linden Bakery at this time was Gordon Jenkins who made the announcement to staff in November 1980. This is not the end of the story of Linden Bakery. When the factory closed in February 1981, a workers co-operative was established and was allowed to continue production under the new name of Craighton Bakery Ltd. Employing 30 staff it was allowed free rental of the pie and hot-plate plants which occupied about 5 per cent of the floor area at the front of the bakery. In addition Lyons Bakery allowed the co-operative access to information about customers and suppliers or raw material and packaging and use of the gas and electricity metering facilities. To maintain continuity of supply when the co-operative began operation on 2 February 1981, workers were allowed to spend the previous weekend in the factory making final preparations. The only request rejected by Lyons was the use of the Linden name and trademarks. The new company had six months to find a new site but they were hopeful that the Scottish Development Agency would make a bid on the site and allow the new company to remain in situ. The idea was instigated by the Scottish Co-operatives Development Committee, backed by local authorities, unions and employees. Allied Supplies agreed to provide outlets for the Craighton products which included Scotch pies, potato scones, Scotch pancakes, crumpets and fruited crumpets at Gailbraith Stores, Templeton's and Presto Discount Stores. These stores hitherto had already taken the bulk of Linden products. Glasgow District Council gave £1,000 to help get the project started and on the opening day the city's Lord Provost performed the launching ceremony in a blaze of publicity, including television cameras. All the workers were committed to investing £250 of their own money and they all agreed to work, sometimes 14 hours a day, with no pay in the first four weeks. The Hove Bakery was originally known as Brighton Bakery and it was situated in Middle Street, Brighton, prior to 1929. It produced goods for the teashops in the area. In 1937/8 it moved to Hove and became known as the Hove Bakery. Products included Iced Fancies and Battenburg cake. In 1919 there was already a Distribution Depot at Hove with at least seven salesmen operating the Hove and Brighton areas. The first teashop in Leeds opened in County Arcade in 1903. There were two other teashops in Leeds (Bond Street and Briggate) and it is not known in which the Provincial Bakery was situated. See also entry for Manchester. It is thought that the Liverpool Provincial Bakery opened as early as 1902/3. Between 1902-1920 no fewer than eight teashops opened in Liverpool. The Bakery won the Provincial Bakery Challenge Shield in 1937. One hundred and thirty-seven guests attended the dinner where it was presented at Reece's Restaurant. Only a half point separated them from Norwich, the previous year winners. The earliest record of the Provincial Bakery in Manchester is dated 1906. This appears in an obituary to M. McCormick in the Lyons Mail October 1938. He had joined the early provincial bakeries 32 years previously in Manchester. From here he was transferred to Nottingham in 1910 when the new teashop opened in Long Row. Later he went to Bradford and was in charge of the bakery there and from Bradford he went to Leeds where he was in charge for many years. Later he was transferred to Bristol. The earliest Manchester teashop opened in 1904 at 34 Market Street. This was followed by three more teashop, all of which opened in 1906 at; 44 Deansgate; 77 Piccadilly and 1 Princess Street. Two more were opened in 1907, one in 1911, one in 1924 and one in 1931. It is possible that the Manchester Provincial Bakery opened in one of the teashops in 1906. No details are known of this bakery. The Provincial Bakery at Norwich is known to have been operating in 1934. They were runners up in 1934 and 1935 in the Provincial Bakeries Challenge Shield Competition, competed for each year by all the Provincial Bakeries. The Nottingham Bakery opened in 1910 at the new teashop situated at 34 Long Row. The manager in charge was M. McCormick (see Manchester). The Oliver and Gurden factory at Oxford came into the Lyons Group when they acquired the interests of the Scribbans-Kemp Fuller, Kunzle Group in 1968. 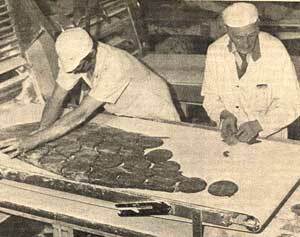 At this time cakes were being produced at their bakery in Middle Way by a production staff of 130. Many were skilled bakers and confectioners and long service was a tradition. The factory had won many awards and medals during their 50 production years. Many of these medals and awards were on display in the company's reception area at Oxford. They were one of the first bakers to use to use electric travelling ovens and two were installed with 44 trays on each. There were also five, twelve-tray double reel ovens and a forty tray reel oven. Oliver & Gurden exported cakes to America, Canada, Belgium, Holland Indonesia, Singapore, Nigeria, Surinam, Bahamas, Tortola and the Virgin Islands. It also had a standing order at British embassies all over the world. Despite these prestige connections an inspection of the factory after acquisition, by Lyons' laboratory staff, identified a lack of proper hygiene controls which were not in keeping with Lyons' own high standards and they were promptly corrected. The first Provincial Bakery opened in Sheffield in 1900 at the teashop in 45 Hight Street. It was managed by John Stall who had joined the company in 1896 and succeeded his father as foreman of the Vienna Department at Cadby Hall. He had a great knowledge of all branches of bakery, particularly Vienna baking, winning a medal as a young man at a Paris Exhibition. He was transferred to the Sheffield Bakery when it opened in 1900. He also superintended the opening of other northern bakeries. The bakery at Smethwick, opened before 1928, was taken over by Lyons in 1968 with the acquisition of Scribbans-Kemp Fuller, Kunzle Group. The Scribbans-Kemp Group had three bakeries; Smethwick employing 1,200 people; Garrets Green, Birmingham where 1,000 were employed and Oxford where the speciality cakes of Oliver & Gurden were made. The Smethwick factory closed at the end of 1977 following the transfer of production to Carlton. Much of its output was concerned with the manufacture of Vienna Swirls, Eccles cakes, fruit pies and deep pie tarts. Colin Abbott, former Smethwick bakery manager, presided at a farewell lunch for the last eight security officers to leave in a nearby hotel on 4 November 1977. Ernie Fellowes, also a former factory manager was there as were three managers from Cadby Hall, Ken Hurst and Bob Inglis (manufacturing) and Don Winter (Personnel). Standing (L-R) Roy Ingledew (Site Manager), Fred Grabewski (Dispatch Manager), Ian ? (Production Foreman), Neville Aston (Production Foreman), Walter Doye (Production Foreman), Ken Elphick (Plant Manager), Ray Labrum (Production Foremen), ?? ?, Jack Mayo (Dep. Chief Engineer), Reg Phillips (Production Foreman), Paul Fell (Production Foremen), Bill Williams (Production Foreman). Seated (L-R) ??? (Production Team Leader), ??? (Training Instructor), ??? (Training Manager) Barry Davis (Production Foreman), Dave Handley (Production Foreman) ??? (Personnel Department). Tottenham Bread Bakery opened in February 1951 to produce a range of sliced and wrapped bread, a small roll and bun bakery and with approximately 20 bread delivery vans for wholesale deliveries. Other bakery items were supplied from Cadby Hall. Wakefield Bakery, Thornes Road, Wakefield, Yorkshire. 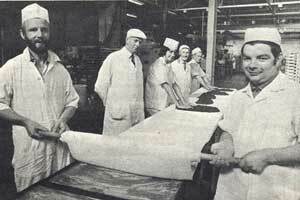 The Wakefield Bakery opened in 1958 to produce Swiss rolls. In 1965 a revolutionary purpose building was built around the plant by a team headed by Harry Hudson. When completed it was considered by many working there as the most modern cake bakery in Europe, a title it lost when the Carlton factory opened. It had a single span 110 foot roof obviating the need for supports thus allowing all floor space to be utilised. This allowed management to lay out production lines in the most efficient way. By 1970 it was employing 230 full-time staff and thirty part-timers. Wakefield too had some of the most modern automated cake plant in the baking industry at this time and had less diversification to worry about than some other factories. All the production was sponge cake and so the factory only had to handle one type of flour. Most of the work was pure production with very little effort devoted to development; that was done elsewhere. The factory produced 450,000 Joly Rolls every week, 150,000 Hostess Swiss Rolls, 90,000 Souflette Sandwiches and 140,000 packs of Baby Swiss Rolls. Add on 80,000 large chocolate enrobed rolls, 200,000 boxes of Trifle Sponges and you've got an awful lot of sponge cake. Peter Ingledew was the factory manager until November 1976 having been there since 1958. R. W. P. Hare took over from Peter Ingledew when he transferred to Carlton in November 1976. In 1979 the bulk distribution administration department was equipped with a Redifon 300 computer to handle van stock control and sales invoicing. The system enabled records to be kept of every stock movement.